صالحی, مژگان, مشهدی عبدل, مریم. (1394). بررسی تجربه بانکداری اسلامی در عربستان سعودی. فصل‌نامه مطالعات مالی و بانکداری اسلامی, 1(تابستان), 169-199. مژگان صالحی; مریم مشهدی عبدل. "بررسی تجربه بانکداری اسلامی در عربستان سعودی". فصل‌نامه مطالعات مالی و بانکداری اسلامی, 1, تابستان, 1394, 169-199. صالحی, مژگان, مشهدی عبدل, مریم. (1394). 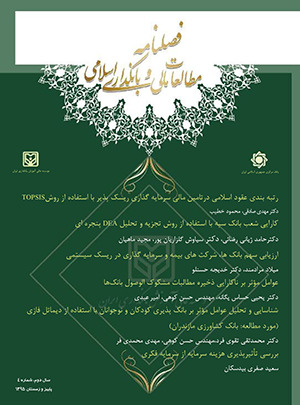 'بررسی تجربه بانکداری اسلامی در عربستان سعودی', فصل‌نامه مطالعات مالی و بانکداری اسلامی, 1(تابستان), pp. 169-199. صالحی, مژگان, مشهدی عبدل, مریم. بررسی تجربه بانکداری اسلامی در عربستان سعودی. فصل‌نامه مطالعات مالی و بانکداری اسلامی, 1394; 1(تابستان): 169-199. رشد چشمگیر بانکداری اسلامی در دهه‌های اخیر، توجه بسیاری از پژوهشگران حوزه مالی را برانگیخته است. عربستان سعودی بیشترین سهم دارایی‌های منطبق بر شریعت را بعد از ایران به خود اختصاص داده است. مطالعه تجربه بانکداری اسلامی عربستان در پژوهش حاضر نشان داد که به رغم وجود نداشتن قوانین و چارچوب‌های مشخص برای بانکداری اسلامی در این کشور و مقاومت اولیه سازمان پولی عربستان (ساما) در برابر توسعه بانکداری اسلامی، نیاز به این نوع بانکداری از سوی مردم این کشور و ابتکار عمل بانک‌ها در عرضه محصولات منطبق بر شریعت با اتکا بر عقودی همچون مرابحه، سهم این نوع بانکداری را به نیمی از کل سهم صنعت دوگانه بانکداری عربستان رسانده است. بی­گمان نبود نظارت مرکزی توسط ساما و شکل‌گیری هیئت‌های شریعت خودتنظیم در مؤسسات اسلامی، به اختلاف آرا در زمینه تطابق محصولات با شریعت دامن زده و مانع گسترش فعالیت بانک‌های اسلامی سعودی به خصوص در خارج مرزهای عربستان شده است. با این وجود، حضور همزمان دو نظام بانکداری اسلامی و متعارف و رقابت میان آن‌ها به ویژه در ارائه خدمات منطبق بر شریعت جهت پوشش تقاضای رو به رشد آن، چشم‌انداز روشنی را برای بانکداری اسلامی این کشور ترسیم کرده است. Significant developments in Islamic banking over the last decades have attracted many financial researchers. Saudi Arabia has the highest amount of assets based on Islamic laws after Iran. Examining Islamic banking in Saudi Arabia in the present study indicates that in despite of the fact that there are no specific laws and frameworks for Islamic banking in that country and the initial resistance of Saudi Arabian Monetary Agency (SAMA) against developing of Islamic banking system, people’s need for this type of banking as well as banks’ innovations in providing services based on the Islamic Sharia in using some contracts like Morabaha, have lead to an increase in the share of this type of banking up to half of all that of the overall banking system of Saudi Arabia. However, lack of inspection on the part of SAMA and formation of various self-regulated religious coalitions in Islamic institutes have led to some controversies about the accordance of the products and services with the Islamic Sharia, thereby posing obstacles for development of Saudi Islamic banks especially outside the country. Yet, the existence of the two systems of banking, i.e. Islamic and conventional, and the competition between them especially in providing services based on the Sharia for covering its increasing demands, have made promising perspectives for Islamic banking system in that country. محرابی، لیلا (1393)؛ رتبه‌بندی مؤسسات مالی اسلامی برتر جهان در سال 2014، پژوهشکده پولی و بانکی بانک مرکزی جمهوری اسلامی ایران. وحیدی تورچی، مریم؛ خاکی، فرشته (1392)؛ الزامات تحول از بانکداری بدون ربا به بانکداری اسلامی، نخستین کنفرانس ملی توسعه مدیریت پولی و بانکی (تحول در مدیریت نظام بانکی، گامی به سوی حماسه اقتصادی)، تهران. Al-Hersh, Nafith (2014);The advancement of Islamic banking and finance in global markets, International Journal of Interdisciplinary and multidisciplinary (IJIMS), Vol 1, No.8. 11-18. Islamic asset management: the future ahead, (2014); Investment management association of Singapore (IMAS), IMAS lunchtime talk series. Islamic Finance outlook, 2014 edition, (2014); Standarad & Poor’s rating services, McGraw Hill Financial. Islamic financial services industry, stability report,(2013); Islamic Financial Services Board (IFSB). Maiya, Rjashekara V; Banerjee, Basudev (2009); Banking on Faith: Islamic banking in the Middle East, Infosys Technologies limited. World Islamic banking competitiveness report 2014-15, (2014). EYGM limited. Bintawim, Samar Sad S. (2011); performance analusis of Islamic banking: some evidence from Saudi arbian banking sector, A Master thesis, Ritsumeikan Asia Pacific University (APU). Aljasser, Ibrahim.A (2013); Islamic banking in Saudi Arabia: financing instrument, the first annual conference of Islamic economic and Islamic Finance, Canada. Al Rajhi, Ahmed et al. (2003); Economic Development in Saudi Arabia (Durham Modern Middle East and Islamic World Series), Routledge; 1 edition. Wilson, Rodney (2009);The development of slamic finance in the GCC, Kuwait Programme on Development, Governance and Globalisation in the Gulf States at the London School of Economics and Political Science with the support of the Kuwait Foundation for the support of the Kuwait Foundation for the Advancement of Sciences. میسمی و دیگران (1391): تحلیل و مقایسه تجربه قانونگذاری و نظارت بر اجرای بانکداری اسلامی در سایر کشورها: دلالت‌هایی برای نظام بانکداری بدون ربا در کشور، فصلنامه مطالعات اقتصاد اسلامی، شماره 8، صفحات 53 تا 92. Song, Inwon; Oosthuizen, Carel (2014); “Islamic banking and supervision: survey results and challenges” IMF working paper. Al-Shamrani, Ali Saeed (2014); Islamic financial contracting forms in Saudi Arabia: Law and practice, A Ph.D. thesis, Brunel University. Ramady, Mohamad A. (2009); Evolving banking regulation and supervision, a case study of the Saudi Arabian Monetary Agency (SAMA), International Journal of Islamic and Middle Eastern Finance and Management, Vol. 2 Iss 3 pp. 235 - 250. Saeed, Abdullah (1996); Islamic Banking and Interest: A Study of the Prohibition of Riba and Its Contemporary Interpretation, Studies in Islamic Law and Society, Vol. 2, Brill Academic Publishers. Zulkifli, Hasan (2010); Regulatory framework of Shariah governance system in Malaysia, GCC countries and the UK, Kyoto Bulletin of Islamic Area Studies, 3-2, pp. 82-115. Saudi Arabia Banking sector, biggest beneficiary of the economic boom.. (2006); Global investment house KSCC. Vayanos, Peter (2008); competing successfully in Islamic banking, Booz & company Inc. USA. Cunningham, Andrew (2014); charting the rise of Sharia-compliant financing in Saudi Arabia, financial market briefing, darien Analytics finamcial market analysis, Vol3, No1. A focus on customer experience pays off for Al Rajhi Bank (2008), A case study, Peppers & Rogers Group. Akram Khan, Muhammad (2013); “What Is Wrong with Islamic Economics? : Analysing the Present State and Future Agenda, Studies in Islamic Finance, Accounting and Governance Series, Edward Elgar Publishing. Alhozaimy, Yousef (2009); The Islamization of Saudi Arabian Monetary Agency (SAMA) and the financial system in the Kingdom of Saudi Arabia, Experience from selected muslim countries. Tabash, Mosab I.; Dhankar, Raj S. (2014); The impact of global financial crisis on the stability of Islamic banks: An empirical evidence, journal of Islamic banking and finance, Vil. 2, No. 1, pp. 367-388.